Dentists shouldn’t have to retire just because they’ve reached a certain age, say doctors. This survey found only 1 dentist in 10 supporting a mandatory retirement age for dentists. In a recent survey, The Wealthy Dentist asked dentists about their retirement plans. Two-thirds of our dentist respondents say that they expect to choose keep working part-time to keep themselves busy. Only 13% replied that they’re on track financially and will retire completely once their financial goals are fully met. One in five dentists would like to retire, but aren’t sure they will be financially able to afford it. We also asked dentists about their target retirement age. And aren’t the specialists lucky! They’re planning to retire an average of six years before their colleagues practicing general dentistry. What’s your target retirement age? New research by over 50 service provider Saga Services indicates that boomers are planning to delay their retirement through the next decade for a wide range of reasons. Over 60% of dentists in our recent The Wealthy Dentist survey acknowledged that their retirement plans have changed for economic reasons. 61% answered yes; the economy has made them change their retirement plans. 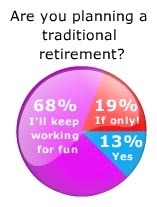 30% reported that they are still on their retirement track, as planned. In past The Wealthy Dentist surveys on retirement, the younger dentists in our surveys were more likely to say they anticipate working longer, but this time 51% of the respondents changing their retirement plans are in their 50’s and 60’s. 41% of the dentist respondents who answered yes to changing their retirement were suburban dentists, while just 22% of rural dentists indicated that they are altering their retirement plans. How have your retirement plans been holding up? Let us know your thoughts in the comments.